Triple cranks are a good choice for some riders. The most common shifting system for triple cranks, Shimano’s STI, only works with Shimano chainrings. Unfortunately, Shimano’s chainring combinations are of limited use to most riders. If you want to customize your chainring sizes, you will have to use downtube or bar-end shifters, plus a front derailleur with a smooth inner cage, to make more useful triple cranks work. On current-production road bikes, triples have almost become obsolete, because 11-speed cassettes provide such a large gear range that a third chainring no longer is needed. SRAM doesn’t even make “road” triples, but Shimano still offers them, and Campagnolo did so until recently. Even with 10-speed cassettes, triples remain a good choice for loaded bikes and/or slower riders. These bikes and riders need a relatively small “base gear,” yet they still pedal at high speeds on slight downhills and with strong tailwinds, so they need reasonably large gears, too. For triples to work well, you want to select your chainrings based on your riding style. However, Shimano offers only a single combination: 50-39-30. This is an odd combination: A rider who finds the relatively small 39-tooth “cruising” chainring useful will probably need a “climbing” chainring with fewer than 30 teeth. More useful triple chainring combinations would be 46-40-26 or 44-38-24, with large rings small enough to be useful for normal riders, with middle rings sized for general riding, and small rings that allow climbing steep hills at low speeds. One of the appeals of our René Herse cranks is the custom gearing. You can choose any ring combination from 24 to 50 teeth. The René Herse crank is designed to drop right into the clearances of a modern crank, so you can replace your existing crank with one that has more appropriate gearing. The René Herse cranks work great for most riders, with one exception: riders who use Shimano STI with a triple. It took us a while to figure out why STI triples are so troublesome. After doing a lot of testing, we found that there are two separate problems. One concerns front derailleurs, the other is related to the way STI executes front shifts. 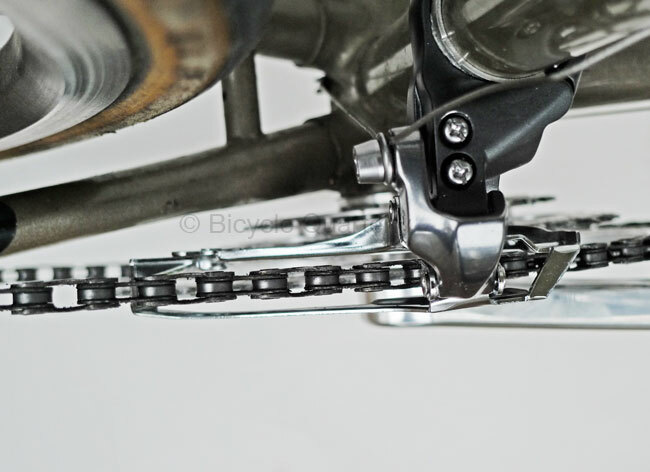 Many front derailleurs for triples have a channel pressed into the inner cage. This is designed to lift the chain onto the big chainring when you upshift. It works only if the channel matches the position of the chain on the middle ring. A derailleur like this works only with a very narrow range of chainring combinations. If you use a differently-sized middle ring, the channel no longer lines up with the chain as you start the shift. In the photo above, the channel is above the chain. The chain gets stuck below the channel, and it’s almost impossible to shift to the large ring. The solution to this problem is simple: Use a front derailleur for doubles, which has a smooth cage and no channels (above). Won’t the lack of channels and other “shift aids” make it shift poorly? Front shifts are not demanding: The derailleur only needs to push the chain into the rotating teeth of the larger chainring, which picks up the chain and executes the shift. A front derailleur does not need a complex shape to work well. A good option is the Shimano CX-70 front derailleur (above). This derailleur is designed for cyclocross bikes with smaller chainrings, so its curve matches that of the smaller rings, and its cage is short enough that it doesn’t hit the chainstays, which can happen when you use standard derailleurs with small chainrings. The CX-70 derailleur is a great choice, whether you run a double or a triple. Using a front derailleur with a smooth cage addresses one problem, but another problem remains: During shifts from the small to the middle ring, to prevent the chain from overshifting straight onto the big ring, triple levers for STI/Ergopower move the chain only part-way, just far enough for a pin on the middle ring to pick up the chain. This is very different from how shifters for two chainrings work: The derailleur pushes the chain sideways until it catches on any tooth of the larger chainring. The chain then is lifted up and threads itself onto the larger chainring, no matter how the teeth are aligned. Why don’t we make triple-crank chainrings with ramps and pins? To offer truly outstanding shifting performance, ramped-and-pinned chainrings must be designed in matched sets. The appeal of the Rene Herse cranks is that you can mix and match chainrings as you like, but that means that there simply are too many possible chainring combinations. We’d have to make hundreds of different chainrings! If you want to use STI/Ergopower and triple cranks, you have to stick with Shimano’s stock cranks and chainrings, whether the gear ratios work for you or not. If you want to use a triple with custom gearing, use downtube or bar-end shifters. Make sure you use a smooth-cage front derailleur no matter which shifting system you use. If you don’t want to give up STI/Ergopower, maybe an ultra-compact double will work better for you. A 44-28 may give you more useful gears than Shimano’s triple chainring combinations. What about STI for double cranks? Shimano’s STI for double chainrings shifts fine with chainrings that don’t have pins and ramps, but for optimum shifting performance, we now offer the Rene Herse 9/10/11-speed cranks with ramped-and-pinned chainrings. Addition (3/7/2015): A reader pointed out that the “top pull” version of the CX-70 derailleur does not swing far enough to shift a triple crank. Only the standard “bottom pull” version works for triples. – Blog post on How to select your chainrings. – How Ramped Chainrings Work. Bicycle Quarterly Vol. 11, No. 2. 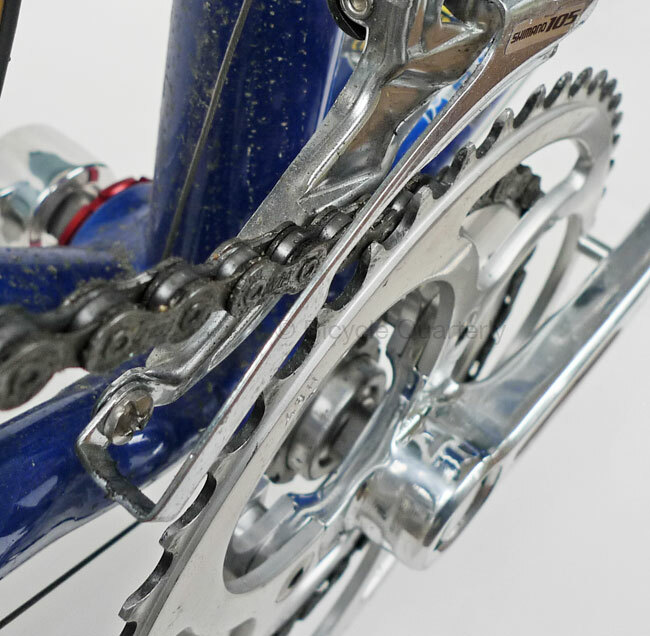 – More information about Rene Herse cranks. This entry was posted in Cranks, Testing and Tech. Bookmark the permalink. Actually, Campy DOES offer a triple: 53-42-30 which is ideal for riders who love to climb, especially on long events. Pair it with a 13-29 and there’s nothing you can’t climb! It’s new but old. They stopped manufacturing a triple for a couple of years. I have an older Campy Record triple and LOVE it! I’ve been happily using Campag 30-40-50 for 8 years. Nice, even spacing. Thanks, I will have to check out the CX-70! I have not found the need for a 10 or 11 speed cassette, especially with their difficult to repair chains, so all of our bikes use 9 speed cassettes with Shimano brifters. To get away from the failure prone and noisy Octalink bottom brackets, and Shimano’s limited chainrings, I switched my dirt road bike to a Dura Ace 7410 with a Phil Wood BB and 48 T Ta, 39T TA triplizer, and 28 tooth granny with a 12-13-14-15-16-17-19-22-27 cassette. It took a while to get the Shimano FD-6503 adjusted, but it does work with this combination and the gearing range is excellent. Great post, Jan, Speaking of triples reminded me to ask if you will be offering a 40-tooth Rene Herse chainring for the middle position? That’s the size I need for my crankset to match the original setup. It doesn’t seem that you’re carrying that size yet, so I wanted to ask if/when it would be available? We are working on expanding the chainring sizes further, and a 40T middle would be an obvious choice. However, we have a firm policy of not giving ETAs until products are ready to ship. Excellent, Jan. I’ll sit tight and order one when they’re available. No rush. I still have plenty of work until I’ll be riding the bike 😉 Thank you! What about using Campy Ergo levers with a non-Campy Triple? Aren’t the older units a simple ratcheting mech and not indexed for the front der? The older Campagnolo units had multiple ratchets for the front derailleur, which seems to have worked fine for most triples. Current generation campy ergos have multiple ratchets as well. This manifests itself in 2 ways: 1) Ultrashift which micro ratchets both up and down. Available in Record and higher, 11 spd, not 10 spd (read: $$). But still, for $225 for a set of ergos it’s in line with “lower” line shimano. And 2) Powershift which micro shifts up in 3 steps, but drops down in one full step. My experience is, powershift works fine with shimano MTB front derailleurs. Never tried with a shimano road. DaVinci Tandem sells a version with campy record ergos where you get 4 chainrings up front and 9 spd shimano/SRAM cluster in the rear with a modified SRAM derailleur (no JTEK required). could always do campy ergo ultrashifts and pick your poison for a FD (I’d use a campy). Currently running on my commuter and am thinking of doing to my rando bike – 8 spd shimano in rear (11-32) and normal road double up front. Would have same low end gearing as my compact double running 11-28 cassette, but much higher on the other end. Of course, more spread out. Still thinking about it…. I run Sugino 24/36/48 with STI and Ultegra triple der, works almost perfectly apart from the shifter needs a little extra movement to move the chain from the 24 to the 36. I am glad it works for you. The 48-36 is relatively close to the 50-39 of the standard Ultegra setup. Even so, you may be lucky. One of our customers broke his STI lever from the “little extra movement” that he needed on a similar setup. I have been using the same set up for over ten years, the extra movement does not stress the shifter. It just takes two little swings of the brake lever instead of one to shift up from the smallest ring. I wonder whether your older triple STI levers function differently from the newer ones we tested? Good point as I use the 8 speed R500 STI shifters, but I can’t imagine the left hand/front der cable pull is different on these to other models. My setup with Tiagra STI 2006 and Sugino 24/36/48 also works fine. I have never noticed having to overshift. I would be very interested to learn if the behavior you documented in STI is a new feature or not. It’s been that way for a few years. We tested a 2006 Shimano 105 triple. It also had only three distinct clicks, and the derailleur didn’t swing far enough to engage the chain on the larger chainring. I don’t know when the generations of various Shimano groups changed, and perhaps your 2006 Tiagra is an older iteration. Generally, Shimano has worked on making their products more “integrated” or “black box” over time. 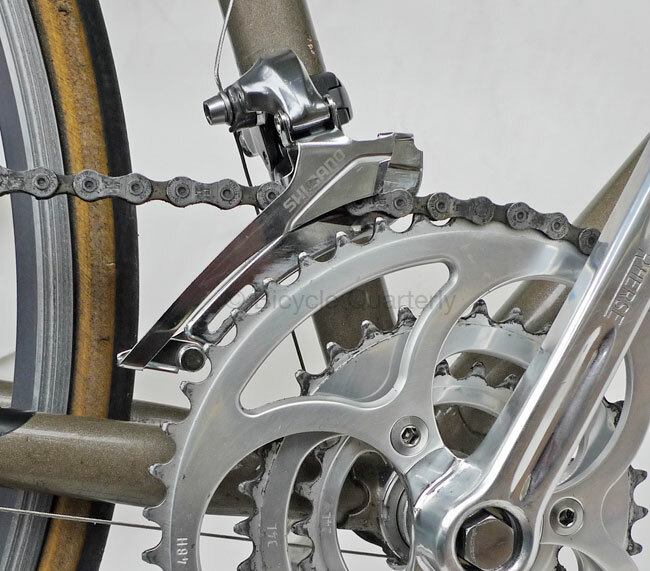 The first indexed shifting still provided feedback of the derailleur position, while later iterations had dialed that out with stronger clicks that masked anything that was happening between chain and cassette cogs. I also am running a sugino 48 36 26 with tiagra level sti and I believe a sora level fd. All 2012 components. Works problem free. I’ve just set up some older 10 speed Campy shifters with an 8-speed Shimano rear derailleur (13-26 cassette) and a front Suntour XC Pro derailleur. The chainrings are an old set of Shimano RSX rings at 52/42/30. So far it’s all working beautifully, no Shiftmate used, and the front shifts very reliably if a bit slowly. I can spend about 80% of my time in the middle ring. With a wider 10 speed cassette I could do 28/48 and probably be in the large chainring on everything but the steepest hills. A future upgrade as a reward for improved fitness! Jan you must have laughed when you got my email last week about the CX70. For the benefit of the rest of you – a CX70 fixed the awful shifting on my Terraferma rando bike with a Herse 46/30 combo. SRAM Red is a nice, light derailleur, but not suited to that combo! I built my bike Oct 2012 using Tiagra 10 speed STI and Tiagra STI 4603. This paired with an IRD Alpine front derailleur and Velo Orange triple crank set (48, 36, 24). In the rear I’m using a Shimano 105 derailleur and a Tiagra 10 speed cassette 12 – 28. All works well and I enjoy the closer gear spacing of the 10 speed 12 – 28 cassette pared with the wide range of the triple. An old Shimano 600 derailleur is a good choice if you need a cage radiused for large rings and long enough to span a triple’s tooth difference. I swapped a Shimano triple for one of these on a bike using a custom ring set and the shifting is far better. Jan, your description of chainring synchronization is the best I have read. But I thought other manufacturers offer synchronized ring sets. Maybe they don’t depend as heavily on synchronization as Shimano does. Sometimes poor shifting can be helped by turning one of the rings one or more bolt positions on the spider to bring the rings nearer to synchronization. SRAM and Campagnolo chainrings also are synchronized, but the shifters initiate shifts at any time. The pins and ramps only serve as “insurance” against a bad shift. With Campagnolo especially, you notice that you have to let up on the pedals to get smooth shifts, since the shift usually occurs before a pin comes along to pick up the chain. I rather like the immediate shifts, as I don’t need to let up as long on the pedals as I have to with STI. 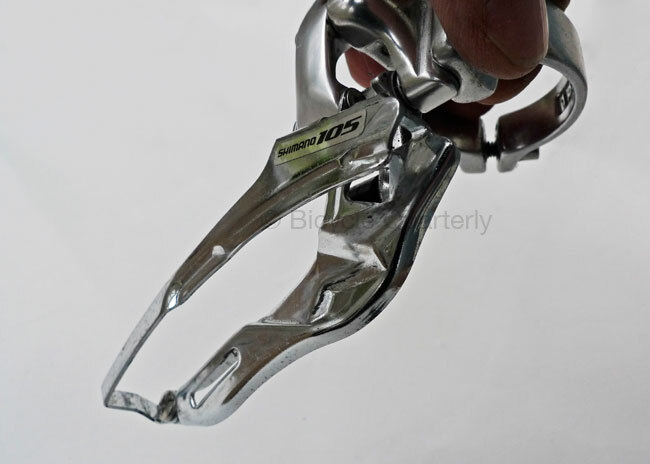 I tried an IRD Alpine front derailleur and found its dimensions and performance identical to the Ultegra FD-6503. Every now and then I find myself thinking perhaps it is time to give index shifting another try. Then i see articles like this and thank the stars for my retrofriction shifters. Yeah. I have a pair of older Shimano 600 friction DT shifters (not fancy, but with a nice feel), Tricolor 600 front double and Ultegra short-cage 9-speed rear derailers running 2×9. 53/39 in front and 13-30 9s home-built cluster. It works every time. I’ve been through just about all kinds of shifters over the years. This is, so far, the best. I also have a Sugino triple 48/36/26 with Shimano 105 STI shifters. I believe my bike was built in 2006. I am on the second set of chainrings and have never had any problems shifting. With the first set of chainrings I ran a 11-32 Shimano DeoreLX cassette and now I have a Sram 11-26 cassette both using a Deore LX derailleur. 9 speed Ultegra brifters and FD (and Ultegra crank) on my bike for 10 years (6503, I believe). The FD has the channel you show. Front rings 48-38-28. They were all Salsa to begin with, but when I found out about the ramps and pins issue about a year later, I changed the outer 48 to a RaceFace ring that worked much better because it had ramps & pins. I wore out the 48 & 38 and two weeks ago I opened the bank account and put on new TA Specialites rings – this time 46 outer and 38 middle. The middle to outer shift has always been fine, no hesitation and seems even better with the TA rings. The inner to middle, as Tim described, requires an extra move, though not always. The brifters still work fine, the FD works fine. On the rear, Deore XT (also 10 years old), and SRAM 11-34 cassette. I turned 70 today, I ride 6500 miles or so per year in hilly areas (including touring), I’ve had knee issues off and on for 35 years (started from running) and of all the things I’ve done to help my knees (many things over the years), the best thing is spinning while I ride my bike, not mashing. So while I may not use my easiest gears very often, I appreciate them when I judge that conditions warrant. PS- this is not my 650B bike. True for 105 but the Ultegra 6603 and 6703 chainsets are actually 52-39-30, which work very well with a 11-28 cassette. No shortage of gears at either end. I am not sure that a 52-tooth big ring is better than a 50-tooth big ring. A 52-11 is about 20% larger than the biggest gear that Eddy Merckx had on his bike, and I doubt most riders today are 20% stronger than Eddy. I’m sorry to hear that Shimano is making newer STI more integrated. I’ve used 7 and 8 speed triple STI with no ramps, no pins, and no problems on many gear combinations. I like triples better than compact doubles because they work well for me in my terrain. Which brings me to the next issue. Why are triples only for “loaded bikes and/or slower riders”? That’s a value judgement that isn’t germane to STI shifting problems. I could just as easily say, “strong riders should use 53/39 doubles”. I don’t, because there’s room in the bike world for all sorts of drivetrains. Personal preference and local geography can validate or invalidate almost any gearing logic. A compact double is your particular compromise, but it’s not the best option for everyone. I understand your base gear concept, and it’s actually a good one. It does depend on both the cogs and chainwheels selected though, so a blanket statement like triple riders “need a relatively small base gear” is meaningless. A 40t triple middle ring is no different than a 46t double big ring if the cogs in the middle of the cassette are properly selected. I agree that Shimano’s 39t middle ring is a little odd, but it’s awfully close to my preferred 50/40/30. I don’t like half-step plus granny, which you think more useful, because I like to make fine adjustments at the rear, not the front. I value your reviews and experience, but you seem to be drifting towards a limited viewpoint and a dismissal of alternate ones. Please don’t assume that your grail is going to be everyone’s grail, or even to everyone’s liking. Please don’t lose your objectivity, OK? I am glad triples work for you, and I am sorry my post could be misread. I was talking about currently available, new bikes. All of those come with 10- or 11-speed cassettes. When you have that many cogs on the rear, you typically have a huge range of 250+%, like a 12-29. (Compare that to the 14-22 five-speed on my Herse: less than 100%.) For most riders, two chainrings on the front are enough with that big a range on the rear. I have clarified this in the post. For riders like you (and me), who opt out of the race to more cogs on the rear, triples continue to make a lot of sense. With 7-speed, you have 3-4 cogs fewer on the rear. Adding a third chainring allows you to space the cassette cogs more closely. By the way, it’s a misunderstanding that I advocate half-step gearing. The 48-44-30 triples that I find so useful may look like half-step at first sight, but really are just cross-over gear trains. To understand them, imagine a compact double in which the big ring is split in two: a slightly larger one for “good days and tailwinds” and a slightly smaller one for “tired legs and rolling terrain”. This allows you to spend most of your time in the middle of the chassette, so you don’t need a front shift every time the road points slightly up or down, or the wind direction changes a bit. I think an often forgotten argument in favor of triples might be the possibility to keep a better chain line at the low end if it is needed often. Is this true? It depends. 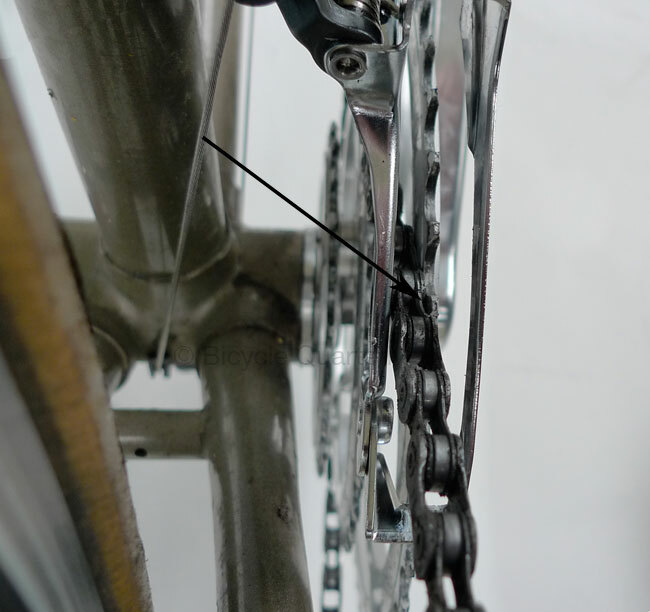 Ideally, your chainline would be on the middle chainring with a triple, so you’d have the inner ring slightly further inward than you would with a double (where the chainline is half-way between the rings). However, it’s a slight difference, and won’t be noticeable in practice. In practice, most makers move their triple cranks outward a bit to provide clearance with poorly designed frames, and the inner ring is about where the inner ring of a double would be. That moves the large ring so far outward that the chainline in the large-large combinations will be bad enough that these gears may not shift reliably. 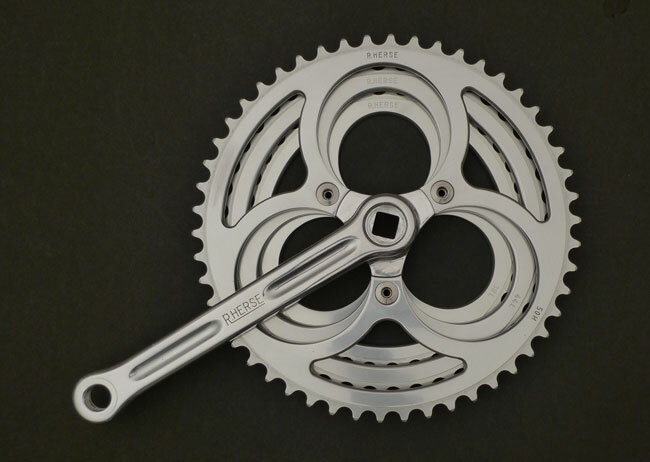 The René Herse crank, when used with a 121 mm BB spindle, is very close to the “ideal” chainline. I use to have all sorts of trouble getting my FSA 52/42/30 triple to work with STI’s. It worked, but the shifting was sub par to say the least. When I built up my Soma ES, I went with a Sugino 48/36/26 with bar end shifters and have enjoyed not having to worry with that aspect of the bike anymore. Glad to see someone show that this is truly a problematic and proprietary issue. I have to join the chorus in favor of using bar-end or downtube shifters over STI levers. Not only to make shifting less complicated, but also reducing the complication of the expensive and non-serviceable levers and the need for absolutely perfect derailleur alignment and cable tension for them to work properly. And of course, the curse of breaking a shift cable inside an STI lever (where they ALWAYS break). All my personal bikes are a “dogs breakfast” of mixed up parts, but all have the characteristic of front derailleur friction shifting, and all offer trouble-free operation. Working in a bike shop, the single most common problem we see rolling in the door is front shifters on STI-equipped bikes not working properly, generally for the reasons I mentioned above. You are providing a great service with this “sounding board” but I sympathize with your loss of time. THANKS! STI, Sram, and Campy brifters are a luxury item like power windows versus crank windows in a car. Unnecessary, but once you get use to them it is hard to go back. There is no doubt that downtube and bar end shifts are much lighter, less expensive, and vastly more reliable. Definitely better for long distance touring or commuting. My most comfortable position riding alone at moderate speed and in a paceline is with my hands on the brifter hoods, with my body in a more upright position, where I can easily brake or shift . I only use the drops when pulling, descending, or hanging on for dear life. So I stay with them and replace cables every 1 to 2 years. They limit derailleur and chainring options, but generally can be accommodated. I think power windows actually do offer conveniences (like opening a window on the opposite side of the car). I would compare STI more to an electronic handbrake on many new cars: Instead of pulling a lever, you flip a switch. Not much of a difference, but if your car malfunctions, you cannot even push it any longer. For most riders, downtube shifters are only a short reach from any handlebar position, and moving my hands once in a while prevents numbness and soreness not only of my hands, but also my arms and shoulders. For riders with a higher position, shifters could be mounted on the top tube, as they were in the 1930s. With modern top-pull derailleurs, this would be easy to do. There are advantages to shift lever integrated into the brake levers, mostly when riding in the city. If you find yourself in too big a gear as you start out of the saddle from a light, it’s easy to shift, whereas with downtube shifters, you have to sit down, shift and then stand up to pedal again. An odd advantage to STI that I didn’t see until I tried them is the comfort of those big hoods, especially the older 8-spd stuff. The big round-ish knob at the end adds a whole new position, palm down and fingers forward. Lower than hoods, not as low as the hooks. I could even see using a gutted lever for a fixie because of that. Goofy looking, though. i built my tourer up with downtube shifters and had great shifting. but after a few tours went to sti’s. when riding hilly areas with less than perfect roads in high winds and rain, i often found myself in the wrong gear near the bottom of steep valleys and no safe way to change gear. sti’s cured this problem. Having toured on a typical loaded touring bike with relatively flexible racks and a rear-loading geometry, I know what you mean! A similar case often has been made for tandems, which are said to be hard to control, and thus needed some sort of handlebar controls (bar-ends in the old days, integrated shifting today). That may be true for many of the tandems and loaded touring bikes on the road today, but it’s more of a design flaw in those machines than based on physics. On a machine with a properly designed front-end geometry, the rider should have no problem taking their hand off the handlebars even in wind and rain. I’ve ridden a tandem in Paris-Brest-Paris that had the shift lever behind the seat tube, and never even found that to be a problem. And now that I have a well-designed camping bike for loaded touring, I find that downtube shifters aren’t a problem, either. I’ve never had safety issues whatever they may be with DT friction shifters on tour, road riding, or in city riding. My bikes are well conceived and built. Cannot otherwise think of what causes the difference between my experiences and those who say they feel DT shifters are not safe. There are differences in riding style, too. Some riders grip the bars very firmly, which perhaps counter-intuitively makes the bike less stable. If you have a light touch on the bars and just guide the bike, then taking a hand off the bars is much easier. However, on some bikes, you don’t have a choice but to grip the bars firmly to keep the bike on the straight and narrow. Rain, night, heavy traffic, and potholes make any kind of shifting more hazardous. Taking a hand off the bars under those conditions is taking a serious risk. If that hand is on the downtube lever when you hit a big unseen water-filled hole, you may be on the ground before you know it. I like DT shifters just fine, but they don’t fit the bill for every use. My favorites by a small margin are bar end shifters. My bike may well be stable enough to cope, but my skill set isn’t. I’m new to touring but not cycling, have been mountainbiking for the last 12 years and had a road bike for the last 4. I didn’t want to go to sti’s, but those few occasions when shifting whilst braking was essential, more than outweigh the ‘cons’. i’m intrigued by electronic shifting too. I’ve already got mechanical disks on my Ti tourer and think they would go well together. If you read Bicycle Quarterly’s brake test, you’ll realize that unless you are on ice, the rear brake does not contribute to the stopping power. So in theory, you could brake with your left hand and shift with your right. In practice, I think it’s not a good idea to shift while braking. I’d rather focus on the braking, and shift once I am done with that. I’m afraid i have to disagree with you there Jan, rear brake is a lot less effective than the front but it has some effect. on some fully loaded days i have had to use both brakes to keep control at the bottom of steep, gravelly descents, (where full use of frontbrake would cause a skid or washout) followed immedeatly by a steep ascent. with d/t shifters i have come to a grinding halt, then get off the bike and try to get it into appropriate gears to continue. i have not had this problem with sti’s in similar or worse terrain. admittedly, much of this may be due to skill level, but the sti’s allow me overcome my poor technique so make touring more comfortable for me. I agree that on gravel, you should use both brakes. The rear brake is useful only when the front wheel risks sliding. On dry pavement, that is never the case (you’ll lift the rear wheel instead), but on slippery roads, that risk is real. Been riding multi-speed bikes over 25 years now and seriously cannot think of a time when I had to shift and brake at the same time. STI most likely, and electric shifting possibly, are advantageous to road racers. They are not at all necessary for touring. If your tour takes you to some out of the way place, any sort of breakdown could prove quite a drawback unless you are one heck of a mechanic. If you like STI or electronic shifting, by all means install on your bike. But saying DT friction shifting on tour bikes is dangerous flies in the face of thousands of tourers who have put in millions of safe miles on tour. Everybody’s riding style is different, and some riders may not have toured at all in the old days when they had to let go of the handlebars. Today, with STI, these riders can tour, and that is a good thing. I brake and shift all the time. Every time I stop at a light or stop sign, I give a solid push with my right ring finger on my Ergo brifter to shift down 2 gears in the rear, while my fore and middle fingers are squeezing the brake. This generally puts me in the correct gear for starting up again. My right lever controls the front brake, so both downshifting in the rear and primary braking are done by the same hand. The aptly-named Ergo levers make this so easy that I don’t even give it a thought any more, it’s pure habit. I didn’t say d/t or barend shifters are dangerous, ‘I’ just prefer them, especially for touring. they make things easier for ‘me’. I did say that there are some specific circumstances where using friction shifters was more difficult than sti’s, and beyond my comfort/skill level. I’m glad you touched on chainlines. I have a mid-90s Ultegra, 30-42-52, with a 9sp 12-25 or 12-23. This puts me in the middle ring and middle of the cassette most of the time. 42-15 is a great flatland cruisin’ gear, and on my bike a perfect chainline. With a fashionable compact double, I’d be fairly cross-chained most of the time. Friction-wise, this matters, almost as much as tires; and it gets worse as a drivetrain gets dirtier. I agree that cross-chaining is not ideal, but from my experience (and Frank Berto’s measurements), the main concern is noise, not extra friction. It certainly cannot be compared to the difference in rolling resistance between different tires, which easily make a 10% difference in speed. How well does a double front derailler, like the Shimano CX-70 recommended in your post, move the chain across a triple crankset, as recommended. Don’t triple front deraillers usually have a somewhat longer reach that doubles? We’ve tested this, and the double front derailleurs have no problems shifting over a triples.